Georgia State is unscathed and 1-0 after coming back to defeat Kennesaw State 24-20 behind a last-minute, game-winning touchdown pass from new starting quarterback Dan Ellington to Diondre Champaigne. The highlight of opening night was Ellington’s guts and determination, landing the Panthers in the best place to win in Ellington’s first Division I football game ever. He finished passing 20-28 for 187 yards and three touchdowns and rushed for a game-high 77 yards in front of a hostile Georgia State Stadium crowd. Head coach Shawn Elliott named Ellington the team’s starter just two days before the game, and the junior college transfer played with high poise and comfortability. Trailing 14-0 with under a minute to go in the second half, the Panthers were in bad shape but found a way to score two well-needed touchdowns before halftime. The team is a young bunch, led by a quarterback who’s calm under pressure and made the plays that mattered. “What a gutsy performance. When I say guts, I mean he laid it on the line. He did everything in his power. He willed himself to make plays, he willed that football team to move down offensively to get that winning score. There were times he took a couple of hits and he got up and just fueled his fire even more,” head coach Shawn Elliott said of Ellington. 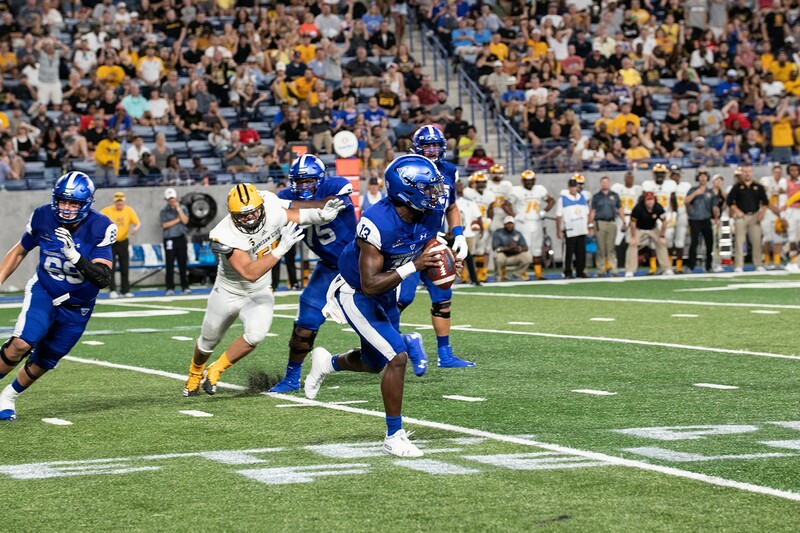 Although Ellington shined brightest, the Georgia State defense held Kennesaw State to just two field goals in the final 39 minutes of regulation. Ellington threw a perfectly placed ball for the 6’3 Champaigne to grab over a shorter cornerback with 41 seconds remaining in the game. Penny Hart and freshman Christian Owens also caught touchdown passes from Ellington. “To address the fans, I’m never going to give up. I’m never gonna stop playing. I’m going to fight to the end,” Ellington said. Georgia State has eight days until they face their lone Power 5 opponent of the season, North Carolina State.